During a sunny April evening at the Butte Chamber Visitor Center on the banks of Blacktail Creek, Butte musician Mike Tierney sang about Evel Knievel while a group of eager Cub Scouts and other kids dove into sample buckets of live aquatic bugs from Blacktail and Silver Bow Creeks. Other youngsters drew colorful sketches on the sidewalks with the assistance of artist Shawn Crowe from the Butte-Silver Bow Arts Foundation. As the kids learned the basics of stream assessment, their parents and other local citizens learned about the past and future of the Silver Bow Creek restoration from local community members and agency representatives active in the restoration process. Through the work of the Citizens Technical Environmental Committee (CTEC), the Clark Fork River Technical Assistance Committee (CFRTAC) and CFWEP, Butte came together to show support for restoration at the Rally ‘Round the Creek. While CFWEP was on hand to provide stream bugs and to run a mini-field trip on basic stream assessment, presentations on Silver Bow Creek by Ian Macgruder from Kirk Engineering and Jim Kuipers from Kuipers & Associates were the centerpiece of the Rally. Ian and Jim are the technical advisors to CTEC and CFRTAC, respectively, and they discussed the Superfund process, which is not exactly speedy, and potential recontamination issues to keep in mind as the community looks toward the future of Silver Bow Creek. 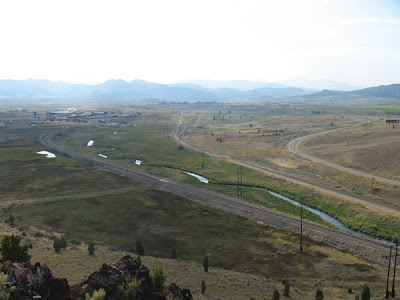 Historically, Silver Bow Creek was used by Butte mining interests as an industrial sewer to remove mine tailings wastes from the immediate area, causing them to settle in the creek channel and throughout the floodplain. 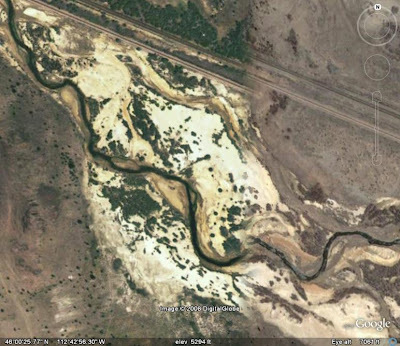 The sandy looking material in the Google Earth image below is tailings. Ongoing remediation and restoration has removed tailings from the floodplain and streambed. Clean soil is hauled in, and the channel is then rebuilt and revegetated. Restored sections of Silver Bow Creek like this reach near Ramsay show vast improvement in terms of vegetation and water quality. Different sites along the Upper Clark Fork River are being remediated and restored on different schedules. In an ideal world, the clean-up would proceed from the headwaters around Butte and Anaconda downstream to Deer Lodge and the Milltown Dam near Missoula. In reality, Superfund is a complex process that involves a lot of negotiating between the Environmental Protection Agency, the State of Montana, local governments, and the Potentially Responsible Parties, or PRPs, a technical term for the private companies liable for environmental damages. Due to the nature of the Superfund beast, downstream sites like the Milltown Dam and portions of Silver Bow Creek are being restored prior to completion of work on the primary sources of contamination around the Anaconda smelter site and the mine dumps of the Butte hill. While a lot of good work has been done downstream and around the headwaters, because mining and smelting wastes in Butte and Anaconda are being left in place and treated on site, the potential for recontamination of Silver Bow Creek and the Clark Fork from surface runoff, while low, does certainly exist. CTEC and CFRTAC are committed to keep the communities of the basin informed of such issues as the restoration continues to move forward. Restoration doesn’t occur overnight, and even when completed, monitoring and maintenance are necessary to ensure the long term health of the environment. By coming out to support the success of the amazing Silver Bow Creek restoration up to this point, and by looking to the future, Butte and the surrounding communities are cruising right along on the road to environmental recovery. Read about the Rally in The Montana Standard here. 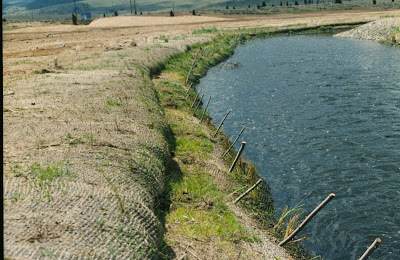 Get the latest Silver Bow Creek update from the Montana Dept. of Environmental Quality and the Natural Resource Damages Program here (pdf file).